We're stoked to unveil another amazing Vinyl Elements custom. 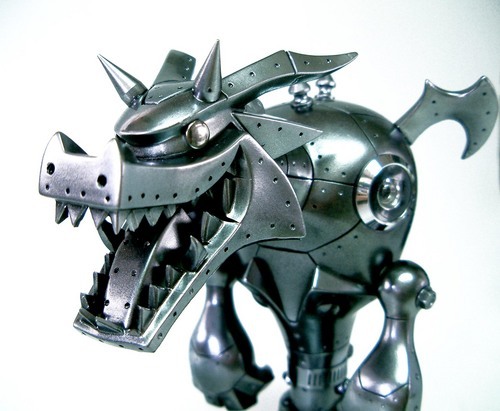 Feast your eyes on the Ultra Metal Goon created by Hong Kong based Ultraman. We stared at this one in awe for a long time. The open jaw of the Goon is a pleasant surprise, and it's executed very cleanly. Then, we get to the "remix" of the Goon body -- wow. Finally, the base ties in each of the five elements represented in the show. 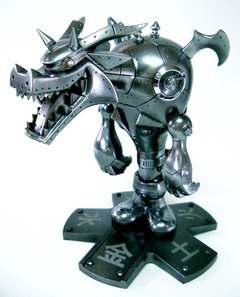 Come on out to Vinyl Elements tomorrow, Thursday May 17th from 7 to 10 PM at Barracuda to check out the Ultra Metal Goon and more stellar customs from some of the top names in the designer toy scene. Vinyl Elements is made by possible by our generous sponsors: Mindstyle [36" T-28], Barracuda, Muttpop [El Panda], Jamungo [9" BUD, 9" Nade, Sqwert], Play Imaginative [10" Trexi], Kaching Brands [FLCL Canti and Fourcube], Kidrobot [Munny], Wonderwall [Goon & Knuckle Bear], and SURU [Suru Droid]. Wooowwwwwhhhhh... This piece is ammmaaaaaazzzzinnnng!!!!!! 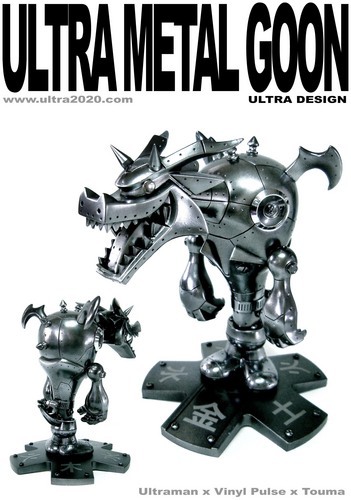 Ultraman really rock with these pieces!!!! You best interview this doode. Better that any of them american customizers. RED CHINA ALL THE WAY!